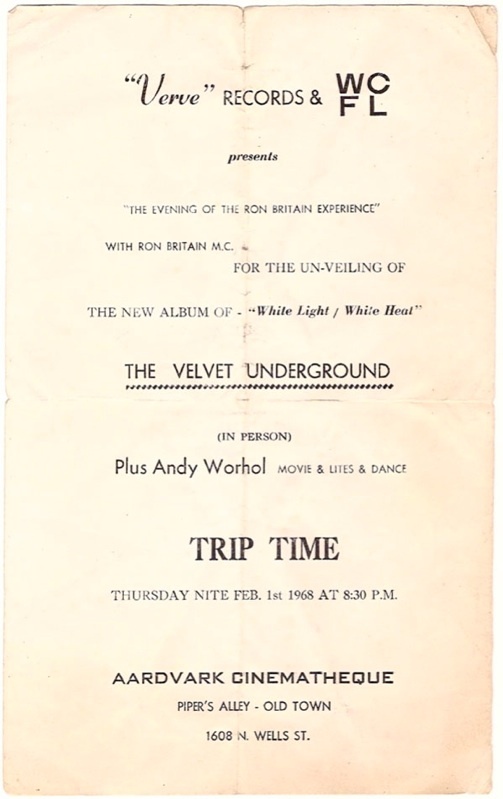 Yours for $2250.00: Offered here is an extremely rare handbill for a 1968 Velvet Underground show and "the unveiling of the new album--White Light/White Heat with Andy Warhol, movies and dance." This was the launch party for the Velvets 2nd album at the Aardvark Cinematheque in Chicago, taking place the week the album was released. This handbill comes from the collection of the late great Sterling Morrison, guitarist of the Velvet Underground, and comes with a signed letter of authenticity from his widow, Martha Morrison. On the back Sterling wrote the name and phone number of a 60's Chicago record store, Wecord Woom. Folded in quarters by Sterling, but long flattened, in Very Good condition. 5 1/2" x 8 3/4".